PartinG’s build against Flash yesterday on Proleague was crazily good. I cannot give analysis of the same depth as what I usually do with Terran builds, but I will try to share why PartinG’s build is good from a Terran perspective. Flash opens up with 12/12 reactor then double Reapers. Reaper opening is the most common opening in the current TvP metagame, and it usually is a single Reaper then reactor build. Flash has been favoring the double Reaper variant since the last season. Many have been talking about the tradeoff of having the double Reapers: Better scout vs. Vulnerability early on. However, although it is rarely discussed, one of the key features of double Reaper opening is that you do not pull Scvs off the refinery. It has several implications. The command centre is delayed slightly. It is not a big deal, since it’s just an opportunity cost. The resource does not line up well for you to take Scvs off the refinery after you get the 100 gas for the double Reapers. The command centre is not going to go down any earlier to make a difference. You will then spend the mineral on barracks. The barracks will be naked and you do not have gas to start stim. It is awkward to take Scvs off refinery for this build. Thus, double Reapers build usually lines up to a 1-1-1 with Widow Mines and Medivacs. Another variation of this build is to swap the factory on the reactor for Hellions. This was used by Supernova in WCS last year. Now with the usual variation being explained, let’s go back to Flash’s build. Like I have said, you will do not pull Scvs out from refinery, and hence, the build has to use the gas somewhere. Flash went for +1 infantry upgrade instead of tech up. This is not the first time I’ve seen this follow up, and in my opinion it is the best variation in the current metagame. 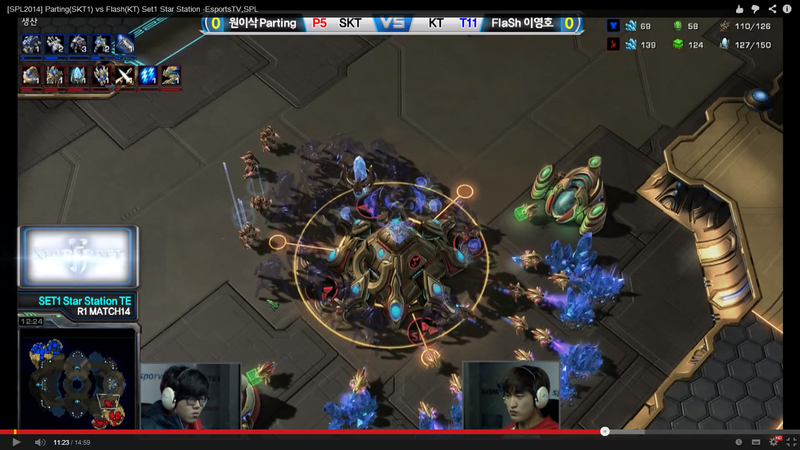 At the other side, PartinG went for double-assimilator at 15 expand, and transited into stargate. He did not skip or cancel the Zealot as Flash is known for this engineering bay block. Flash scouted the gas timing, and could deduce the possible builds. He confirmed that there was an expansion and tech path (stargate) later with his Reaper. The talking point of PartinG’s build is the third nexus timing: 7:35. That is very early. The thing is, can you get away with it? The answer is yes. Firstly, the single Oracle can pin Terran in base. 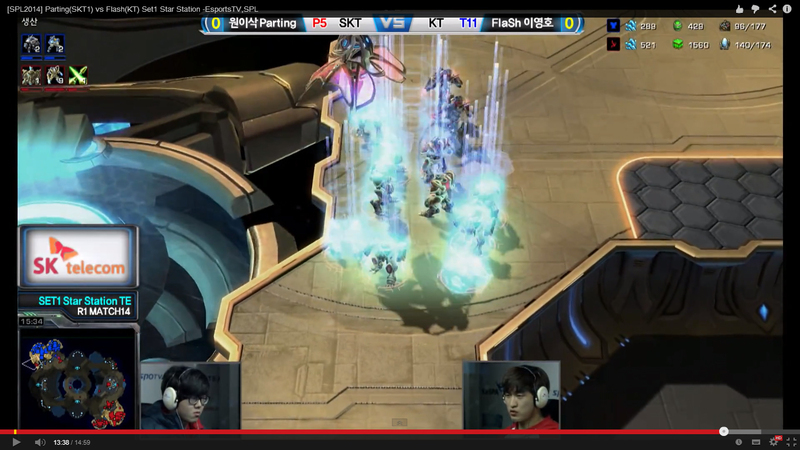 It restricts Terran’s reaction moves to the quick third nexus, which was scouted by Flash. In the game, Flash placed a missile turret at each mineral line, and this makes it easier for him to move out. 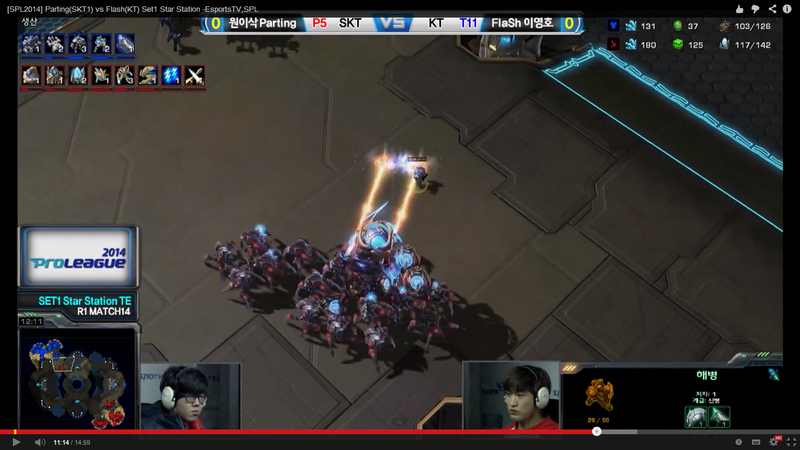 PartinG’s Oracle was parked at the exit of Flash’s natural, so he knew Flash was reacting to the quick third nexus. Back at PartinG’s base, he did not tech up but chose to put down more gateways and research blink. It is hard for Flash to punish the third nexus because PartinG would have enough units. The photon overcharge removes any doubt that PartinG was probably going to take some damage. PartinG’s godlike force fields were the icing on the cake. You could argue that the game was already decided at that point. The only chance for Flash to take it is that PartinG was caught in tech transition. But given the number of warpgates, it was not going to happen. To PartinG’s credit, he played very well tactically from there, albeit he made some micro mistakes. PartinG went for charge upgrade before he put down the templar archive. At this point, he did not sit back to defend as he knew that Flash could not compete with his force. PartinG faked for an gateway timing which forced Flash to play defensively. To make this move even better, he showed a hallucinated Colossus with Templar tech behind it. This fake push also bought PartinG time for him to tech up. Brilliant. Once the objective of that fake push was accomplished. PartinG decisively recalled back. Everything went according to PartinG’s script. Flash moved out after PartinG recalled back. By then, charge was done and storm was completed when Flash reached the other side of the map. 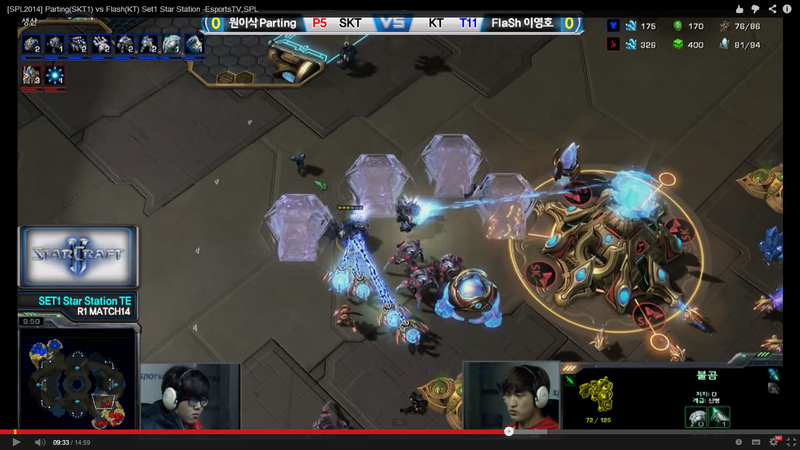 During the big battle, PartinG even made a Warp Prism and a 4th nexus. The mass Zealots Warp Prism warp in just ended the game on the high. PartinG why you so good? Even the ceremony was perfect. I feel like that Parting’s build look double good when Flash made 2 odd decision imo. He had really 3 really good scouts with those reapers. Firstly he saw the stargate oracle, which led him to build 2 turrets which I thought put him in a slight lead as the oracles did no damage. Then he saw the fast 3rd, which should have triggered him to build a fast 3rd CC? Since Parting didn’t know that he knew this I felt is the more standard choice rather then staying on 2 base. And the strangest decision of all, was seeing 5 gates going down, and then deciding to attack without any forward scouting marine or anything. It seemed like the scouts he did didn’t matter at all! Quite disappointing. However, very impressed with TY’s creativity so far in Proleague… and zomg Maru is a boss! Flash moved out because of the third nexus, and he scouted the main (more gateways) to see what’s the follow up. The gateways didn’t directly affect what his units achieve there as the buildings are not ready yet. If he sat back, he would be further behind as PartinG had the third way earlier than his. Maru is the Terran hope in Proleague! Boom! GG & thanks for the write-up.